AT WHAT AGE DO PUPILS COME TO BANCROFT’S? There are two main ages of entry to Bancroft’s at 7+ (into Year 3) and at 11+ (into Year 7) There is a smaller entry at 16+ (into the Sixth Form). DO I HAVE TO APPLY AS SOON AS MY CHILD IS BORN? No. There is no need to register for the entrance exams more than a year ahead. CAN I SEE ROUND THE SCHOOL? We have a series of Open Events in the summer and autumn terms, click here for details. HOW HARD IS IT TO OBTAIN A PLACE AT BANCROFT’S? 7+ (into Year 3). Entrance is by our own competitive tests, held in January of the year of entry. Candidates will be invited into the Preparatory School on two separate occasions and no special preparation is needed. We have 66 places available at 7+ and children join from a very wide range of independent and state schools. We are looking for pupils who are likely to achieve a significant number of 8 or 9 grades at GCSE with a minimum of five 8 or 9 grades, and at least an 8 in the subjects they wish to study at A Level. An offer of a place at 16+ is conditional on achieving five 8 or 9 grades at GCSE. We may also offer fee paying places on the basis of GCSE results in August. WHEN ARE THE 11+ ADMISSIONS TESTS? The 11+ tests take place in January in the year of entry. HOW DO YOU ASSESS POTENTIAL SCHOLARS? In assessing potential scholars, we look for academic leadership and intellectual curiosity. We try to distinguish the bright from the well drilled, the inspired from the effective and we aim to uncover flair. Considerable time is taken to ensure that the process is fair. Candidates who are offered a Scholarship must also fulfill the minimum entry requirements. These awards continue whilst the pupil maintains their educational potential and abides by the school rules and policies. Candidates who are not awarded a Scholarship may be offered a fee-paying place at Bancroft’s. Those who have applied only for Scholarships are not considered for fee-paying places, even if their performance was good enough to have earned them a place. IS THERE ANY ASSISTANCE FOR THOSE WHO CANNOT AFFORD THE FEES? We offer a number of Means Tested Awards (Bursaries), including Francis Bancroft and Foundation Awards at 11+, Francis Bancroft Award at 7+ and Means Tested Awards at 16+. These are offered on the basis of the entrance exam, to those whose parents’ income would not allow them to afford the full fee. CAN MY CHILD APPLY TO MORE THAN ONE SCHOOL? Yes, you can register your child to sit entrance examinations for more than one school, but you will only be able to accept a place at one. WHAT KIND OF PUPIL THRIVES AT BANCROFT’S? Bancroft’s welcomes pupils who are enthusiastic, intelligent and well-behaved, and who will make the most of School life and Bancroft’s excellent facilities. What are the main feeder schools to Bancroft’s? 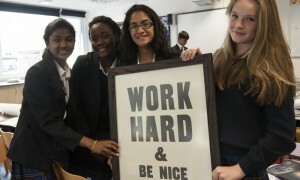 We welcome applications from pupils at any school, whether they are at a state school or independent school in the UK. There are a few schools that send us a number of pupils each year, but we do not give preferential treatment to pupils from any particular schools. Our advice to parents when choosing a primary or prep school with a view to their child coming on to Bancroft’s afterwards, is to look for one that offers a wide range of activities outside the classroom, as well as good academic and pastoral support. This will give you a good idea of whether your child is suited to Bancroft’s, and will increase their chances of getting into Bancroft’s as they will have more to offer in terms of a range of interests. Having said that, if your child is enthusiastic, bright, and ready to make the most of Bancroft’s opportunities, then it does not matter which school they currently attend. WHAT ARE THE ADMISSIONS/REGISTRATION/EXAMS/INTERVIEW PROCEDURES? THE TIME FRAME FOR INTERVIEWS? Click on the links below for further information about entrance procedures. CAN I REGISTER AT AN OPEN MORNING? Yes if you have a copy of your child’s birth certificate or passport and the registration fee with you. MY CHILD WILL STILL BE 10 IN SEPT WHEN TERM STARTS. WILL YOU STILL ACCEPT HIM/HER? Possibly if he/she has completed Years 1-6 successfully and is intellectually and emotionally ready for senior school in terms of maturity. Bancroft’s Prep School takes children from the age of 7 up to 11; they then transfer to the Senior School. 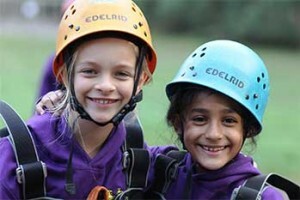 Bancroft’s Senior School takes children from the age of 11 through to 18. All candidates must be registered by 1 December of the year prior to entry to Bancroft’s. We hold a series of Open Days throughout the year for prospective 7+ and 11+ candidates; the dates are advertised on the school website and we suggest that you attend one, with your child, in the nine months before the child would sit the entrance exam. WHAT ARE BANCROFT’S LOOKING FOR IN THE INTERVIEW? Interested and interesting children; the School is looking for pupils who will contribute significantly and make the most of the opportunities offered to them by Bancroft’s. WHEN DO WE HEAR IF WE’VE BEEN OFFERED A PLACE? Offer letters for 7+ and 11+ are posted out in the February following the exam. Offer letters for 16+ are posted out in the December following the exam. Details are given to candidates as they leave the exam; this timetable is agreed in advance with other local schools. HOW MANY CHILDREN SIT THE 11+ ENTRANCE EXAM IN A TYPICAL YEAR? HOW DO SCHOLARSHIPS AND AWARDS WORK? For 7+ entry (into Year 3) up to two Francis Bancroft Awards available. These are means tested and awarded to bright children whose parents might not otherwise be able to afford the fees for Bancroft’s Prep School, based on the results of the 7+ entrance tests. Parents are required to submit a comprehensive and confidential statement of their income and assets, reassessed on a yearly basis. The value of a Francis Bancroft Award depends on a number of factors, including total income and the number of dependants. A Francis Bancroft Award at 7+, will only cover a pupil’s time at the Prep School. For 11+ entry (into Year 7) the School awards Drapers’ Scholarships, Means Tested Awards (including Francis Bancroft Awards and Foundation Awards) and Music Scholarships. Drapers’ Scholarships, each covering up to one quarter, one third or one half of the school fee, are awarded on the basis of academic distinction in the entrance exam and at interview, without reference to parental income. Competition for Scholarships is high. There is no separate examination for those wishing to be considered for Scholarships. School reports and interviews are a vital part of the selection process. Means Tested Awards (including Francis Bancroft and Foundation Scholarships) are designed to support pupils of high ability whose parents provide evidence that they might not otherwise be able to afford the full school fee. These are awarded on the results of the 11+ entrance exam with school reports and interviews playing an important part. The value of an award depends on a number of factors, including total income and the number of dependent children. Parents are asked to complete a Financial Disclosure Form (FDF). Means Tested Awards are given based on the results of the11+Entrance Examination, with school reports and interviews playing an important part. Up to two Music Scholarships, each worth either up to one quarter or one half of the school fee, are also offered to children with outstanding musical talent. Further details are available in the 7+ Information Book or Music Scholarships at 11+..
At 16+ (into the Sixth Form) the School awards Academic Scholarships, Means Tested Awards and Music Scholarships in the Sixth Form. We expect all potential scholars to have mainly A* predictions from their current school as well as a very positive reference. Academic Scholarships each covering up to 50% (half) of the school fee are normally available to new applicants to the school on the basis of academic distinction in the entrance exam and at interview, without reference to parental income. Means Tested Awards are designed to support pupils of high ability whose parents provide evidence that they might not otherwise be able to afford the full school fee. The value of an award depends on a number of factors, including total income and the number of dependent children. Parents are asked to complete a Financial Disclosure Form (FDF Form). 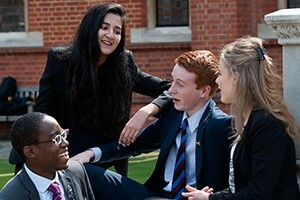 Means Tested Awards are awarded based on the results of the Sixth Form Entrance Exam with school reports and interviews playing an important part. A Music Scholarship worth up to 50% of the school fees plus tuition on one instrument at School, or a contribution towards tuition on one instrument outside School is also available. Further details are available in the Sixth Form Information Book or Music Scholarships at 16+. IS THERE A FEE REDUCTION FOR SIBLINGS? WHERE IS THE REGISTRATION FORM? At the back of the Information Book or downloadable from our website. WHY ARE THERE NO IQ AND/OR VERBAL REASONING TEST AT 11+? These are no longer regarded as something children cannot be prepared for. We try to link our entrance papers in with KS2 syllabus so that children from all schools are ready for the test. CAN YOU RECOMMEND A TUTOR FOR COACHING? We discourage long periods of intensive coaching as it boosts a child artificially and without the prop they may have difficulty maintaining the required standard when they get here. Tutoring for a short period to give a child familiarity with an entrance paper and confidence is better for a child’s well-being and future prospects. DO YOU HAVE SAMPLE PAPERS AVAILABLE? 7+ Entrance is by our own competitive tests, held in January of the year of entry. Candidates will be invited into the Preparatory School for testing on two separate occasions. 11+ Applicants for entry at 11+ sit two papers: English and Maths. Sample papers are available for download from our website. Applicants nominate the two subjects in which they would like to be examined by indicating their choices on the application form. Specific revision will not be required and the questions will be appropriate to all GCSE exam boards and syllabus. In addition, they sit a 90 minute problem solving and critical thinking paper. Please note that candidates wanting to take mathematics A Level must sit the Mathematics entrance paper. DO YOU HAVE A SCHOOL BUS? WHY NOT? Currently no. We believe that this might inhibit after school activities for many pupils. We have very good Public Transport links. We encourage parents to subscribe to our car sharing app “Home Run” to facilitate car sharing. We do offer a minibus shuttle from Loughton Station for pupils travelling by London Underground to Loughton Station. This service is aimed primarily at pupils in the senior school. We would try and accommodate a physically disabled child, we have a lift and ramps. Unfortunately as Bancroft’s School is a Listed Building there would be some constraints and inaccessible areas. We would try and accommodate a pupil with a medical condition, dependent upon the medical condition and whether it was something our School Nurse could assist with. Bancroft’s School is committed to equal treatment for all regardless of race, ethnicity, religion, sexual orientation, disability, learning difficulty or social background. We are an academically selective school and we believe that the educational experience can only be enriched if children are exposed to as wide a range of cultural experiences as possible whilst they are developing. OUR AIM IS TO BE INCLUSIVE. WHAT MODERN LANGUAGES DO YOU OFFER? Spanish, German, Russian and French. All pupils take a GCSE in one modern foreign language. Pupils may take an additional GCSE in their family language. We aim to have a maximum of 24ish per class in the Third and Removes Forms (Years 7 and 8), then class sizes reduce when GCSE and A Level options are chosen. Prior to GCSE groups (up to year 10) only in Maths. For GSCEs children are banded in sciences and English. WHAT ARE YOUR GCSE RESULTS? In 2018: 98.6 % of exams were awarded grades 89-5 or A*- B, with 65.9% awarded an A* or grade 9 or 8. WHAT ARE YOUR A LEVEL RESULTS? WHERE DO YOUR LEAVERS GO? 99% of our Sixth Formers progress to higher education, the majority to leading universities (Russell Group), medical schools and art colleges. 10% of a year group will typically go on to study at Oxford or Cambridge; around 15% of a year group will progress to study medicine (including dentistry and vet science). Popular destinations for leavers included Cambridge, Nottingham, Durham, Exeter, Bristol, Birmingham, King’s London, Warwick, and Imperial College.